I found this article online and enjoyed reading it so am posting here. It questions the concept of discipline and points out Australians had the most troops in military prison but were also the only pure volunteer force, the only Army without the death penalty and one of the elite armies of the war. They travelled furtherest, were away the longest and were the cream of the Britsh forces in fighting but were "undisciplined". In 1918 an average of 9 per 1,000 Australian soldiers in Europe resided in prison. Among Canadians, New Zealanders and South Africans there was an average of 1.6 per 1,000 men behind bars. Field-Marshall Douglas Haig was convinced this was due to the low standard of discipline among the Australian divisions. "Tell us what you want us to do, Sir - but you must let us do it our own way"
Until this very day military strategists impress on officers the value of discipline among the troops. Almost unanimously is the thought that only disciplined soldiers are ready for war. Undisciplined men are disobedient troublemakers. They can't be trusted and they won't fight well. It seems that one of the great experiences of the First World War - and a true heritage of that Great War - is going to be forgotten. This Australian lesson is worth to be remembered - not only in Australia, and not only in military circuits. The Australian lesson learns that discipline has nothing to do with dedication, and very little with training. The keywords in this lesson are: collective discipline and individualism - words that sound like curses in the ears of many a commanding officer. In the First World War the Australian soldiers earned a outstanding reputation. They fought in many of the great theatres of war: Gallipoli, Damascus, Gaza, Somme (Pozières), Fromelles, Péronne, St. Eloi, Ypres (click on the picture right) and Passchendaele. Right from the beginning English officers complained about the undisciplined behaviour of the Australians. Their officers and soldiers did not keep the necessary distance, they dressed improperly, even with nonchalance - some didn't even shave everyday. And some soldiers even dared to object if they had to carry out a task they did not like. The rumours very soon reached the War Cabinet and the Prime Minister in London. It was obvious: with these dirty and slovenly troops you can't win a war. "I do hope that we shall hear no more of the 'indiscipline' of these extraordinary Corps, for I don't believe that for military qualities of every kind their equal exists. Their physique is wonderful and their intelligence of a high order." At Gallipoli the Aussies were landed at the wrong beach and suffered terrible casualties in a rugged and confined war theatre. But it was worse in France where, in hellish conditions, the young men were led to pure slaughter. But there too, they fought like no one had ever seen before. The Australians began to arrive in France from the Middle East in March 1916. At the end of that month Commander-in-Chief Field-Marshall Douglas Haig (picture right) inspected the 2nd Division. Afterwards Haig wrote in his diary: "The men were looking splendid, fine physique, very hard and determined-looking. The Australians are mad keen to kill Germans and to start doing it at once!" The Australians had their first battle experience on European soil on July 20th, in the Battle of the Somme. They took the village of Pozières. However, their claim to reach the Windmill proved untrue. Prompt German counter-attacks made their position very delicate. Haig wrote: "The situation seems all very new and strange to Australian HQ. The fighting here and the shell-fire is much more severe than anything experienced at Gallipoli. The German, too, is a very different enemy from the Turk!" The Australians, like their British comrades, were learning the art of war the hard way. They learned amazingly fast - and their morale stayed terrific. More than once Haig intervened personally when he thought the Aussies were going too fast. Haig in his diary: "The Australians had said at the last moment that they would attack the Windmill again without artillery support and that 'they did not believe machine-gun fire could do them much harm'. We arranged that the original artillery programme should be carried out. The Australians are splendid fellows but very ignorant." "There, dead lay everywhere. The deeper one dug the more bodies one exhumed. Hands and faces protruded from the slimy toppling walls of trenches. Knees, shoulders and buttocks poked from the foul morass..."
One ANZAC Corps obtained all its objectives and took 3.900 prisoners. The other ANZAC Corps took all its objectives and met the Prussian Guards who they had met before at Pozières on the Somme. This Corps took no prisoners. One of the fierce Aussie soldiers who fought at Polygon Wood was Barney Hines, known as the Souvenir King due to his escapades of robbing the German dead. Apparently even the Kaiser heard of him and branded him a "barbarian... typical of Australian Troops on the Western Front". But private Hines was of Irish descent and born in Liverpool. When the Great War broke out he was working in a sawmill in Australia. Despite being in his early 40s, he tried to enlist but was turned down on medical grounds. Undeterred, he haunted recruting centres until he was accepted. Hines became one of the legends of the Great War. He generally disdained conventional weapons such as his Lee Enfield rifle preferring to go into action with two sandbags packed with Mills bombs (hand grenades). It is uncertain whether stories like this ever reached the staff. But they sure contributed to the reputation of the Australian soldier. As the war continued Field-Marshall Haig's admiration for these notable soldiers grew, though they never ceased to puzzle him, as they did most British officers - and ordinary Tommies too. During Third Ypres lieutenant P. King of the 2/5th Btn. East Lancashire Regiment, was stuck with a small left-over of his company in the mud near Poelcapelle. The men were exhausted, had been under constant fire for two days and desperate for relieve. But no one seemed even to know that they were there. "Suddenly, to my great surprise, I heard voices behind me and I looked back and there were three very tall figures, and one was actually smoking. I could hardly speak for astonishment. I said, 'Who the hell are you? And put that cigarette out, you'll draw fire!' He just looked back at me. 'Well, come to that, who are you?' I said, 'I'm lieutenant King of the 2/5th East Lancashire Regiment.' At which he said: 'Well, we're the Aussies, chum, and we've come to relieve you.' And they jumped down into the shell-hole. They didn't seem to be a bit bothered. The last I saw of them they were squatting down, rifles over their shoulders, and they were smoking, all three of them. Just didn't care!" "We have had to separate the Australians into Convalescent Camps of their own, because they were giving so much trouble when along with our men and put such revolutionary ideas into their heads." Haig was convinced that a great deal of the problems were caused by General Birdwood's relaxed disciplinary methods. Sir William Birdwood (picture right) was Imperial (English officer who commanded the I ANZAC Corps and later the Australian Corps) and he never found great favour in Haig's eyes. The truth is that Birdwood was one of the very few senior British officers who possessed the 'touch' to command Australians, the perception necessary to extract their qualities. Another 'troublemaker' was the Australian brigadier-general Thomas William Glasgow. Passed into a proverb are his remarks when he was ordered to attack Villers-Bretonneux, a French village vital to the integrity of the whole Allied line. General Heneker told him that the attack was to be made from Cachy. Glasgow, who had studied the scene, said he could not do it that way, because that would cost too many lives. "Tell us what you want us to do, Sir," he said, "but you must let us do it our own way." General Heneker was flabbergasted, especially when Glasgow also said that he wanted the time of the attack changed. British army officers were not supposed to argue with their superiors. But after some arguing it was settled that the attack should be made as Glasgow desired (the attack became a resounding success). Another important difference between Australian and British troops was that the Aussie officers explained extensively to their men the objectives of the battle they were about to engage in. Even ordinary soldiers then knew the strategy that was behind it. When they became cut-off they still knew what to do, what the goal was. "Very much and very stupid comment has been made upon the discipline of the Australian soldier. That was because the very conception and purpose of discipline have been misunderstood. It is, after all, only a means to an end, and that end is the power to secure co-ordinated action among a large number of individuals for the achievement of a definite purpose. It does not mean lip service, nor obsequious homage to superiors, nor servile observance of forms and customs, nor a suppression of individuality... the Australian Army is a proof that individualism is the best and not the worst foundation upon which to build up collective discipline." An example of the clashes between the two conceptions is what happened at the camp in Strazeele (Belgium), where the Australians were encamped on the other side of the road from the 10th Royal Fusiliers. The Tommies were simultaneously shocked and impressed by the Aussies' casual attitude to war - or at least to the Army. It could hardly be right for Aussie privates to address their commanding officer as 'Jack', but the Fusiliers heard them do so with their own ears. "The Colonel decided that he would have a full dress parade of the guard mounting. Well, the Aussies looked over at us amazed. The band was playing, we were all smartened up, spit and polish, on parade, and that happened every morning. We marched up and down, up and down. The Aussies couldn't get over it, and when we were off duty we naturally used to talk to them, go over and have a smoke with them, or meet them when we were hanging about the road or having a stroll. They kept asking us: 'Do you like this sort of thing? All these parades, do you want to do it?' Of course we said, 'No, of course we don't. We're supposed to be on rest, and all the time we've got goes to posh up and turn out on parade.' So they looked at us a bit strangely and said, 'OK, cobbers, we'll soon alter that for you'. The Australians didn't approve of it because they never polished or did anything. They had a band, but their brass instruments were all filthy. Still, they knew how to play them. The next evening, our Sergeant-Major was taking the parade. Sergeant-Major Rowbotham, a nice man, but a stickler for discipline. He was just getting ready to bawl us all out when the Australians started with their band. They marched up and down the road outside the field, playing any old thing. There was no tune you could recognise, they were just blowing as loud as they could on their instruments. It sounded like a million cat-calls. And poor old Sergeant Rowbotham, he couldn't make his voice heard. It was an absolute fiasco. They never tried to mount another parade, because they could see the Aussies watching us from across the road, just ready to step in and sabotage the whole thing. So they decided that parades for mounting the guards should be washed out, and after that they just posted the guards in the ordinary way as if we were in the line." To the Australian troops it seemed that the British Army was obsessed by discipline. They would never stood for it. At several occasions Australian soldiers sabotaged First Field Punishment British soldiers were sentenced to ( for instance when Tommy had been found drunk or had been wearing dirty clothes when off duty ). First Field Punishment meant that the soldier first had to parade in full pack. Then he had to take the pack off and Military Policemen strapped him up against a wooden cross, often one in a wagon wheel. It looked like he was crucified. This happened twice a day, an hour in the morning and an hour at night, and for as many days as the soldier was sentenced to. It happened that Australian troops, incensed by the sight of a man undergoing Field Punishment, cut the man loose again, and again, and threatening the MP's - with loaded rifles, daring them to truss poor Tommy up again. The British Army Staff did not very well know what to do with these and other Australian crimes. The mutinies in the French Army made some high-ranking officers nervous. They feared that the casual and highly self-conscious attitude of the ANZAC troops would have a deleterious effect on the more docile British troops under their command. In the British assessment the reputedly high crime rate of the Australians also played a significant role. A rather high number of Aussies were put behind bars for some time. In the winter of 1918 an average of 9 per 1,000 Australian soldiers resided in prison. Canadians, New Zealanders and South Africans had an average of 1.6 per 1,000 men behind bars. Some punishments however were not forced down on Australian troops. Though liable to be executed for mutiny, desertion to the enemy or treachery, the 129 Australians (including 119 deserters) that were sentenced to death during the war (117 in France) were not shot. The 1903 Australian Defence Act stipulated that the Governor General of Australia had to confirm all sentences passed by courts-martial - and he never endorsed death sentences. Although Haig made strong representations for power to inflict the extreme penalty upon Australian soldiers, the sanction was continually denied. A major consideration was the Australian soldier's status as a volunteer, and that as such, these men should not be subject to the extreme penalty. After all - enough men were killed already. More than 61.000 Australians died in this war, mostly on the Western Front. Australia's casualty rate was, relatively, the highest of all allied nations. Picture: French children attending Australian graves. Sources for this article / Bronnen voor dit artikel. Last edited by alf on 11 Sep 2006 12:09, edited 1 time in total. Great article thanks for posting. Gotta love the Australian free spirit. Very interesting and informative article. I do have one slight quibble, not at all with the core of the article. At the end it was stated that the Australians has the highest casualty rate of the allied nations. I have been to Serbia a bunch of times and speak fair Serb. But I was dumbfounded to recently read figures on the overall casualty rates of the various countries in WW I. Next to the highest was the French and Germans, with one in 35 and 36. Top rate was Serbia, with one in eleven. I think that is the whole population, men, women, children, priests, etc. PS: Incidentally, my father fought at the ANZAC bridgehead, but with the Turks, as part of the volunteer company of Pioniere that the Germans sent to help them. I think that he, trained in construction engineering, worked on mining warfare. Anyone with any info on this unit or mine warfare at that salient please speak up. The topic of Gallipoli is a bear to research, and I have even gone to Istanbul three times with almost no success. And Turkish is an absolute bear to attempt to translate. I am familiar with Bean's History that happily is on-line. Thanks in advance. The Australian officer corps did not spring out of nowhere, and it was clearly very un- British. Yet Australia only became independent of Britain in 1901, and Duntroon was only established in 1911. Presumably the most important formative influence on the officer corps would have been the Boer war (where there were visible repeated follies by the professional British army fighting against the Boers). I can find nothing much on the net ... What was the background of the AIF leadership, particularly betwen 1901 and 1911 prior to the estalishment of Duntroon ? And who were the men in charge of educating the junior officers of that time? Spent some time at that site, some great stuff there. Very interesting article on Hitlers service, will make another thread about it. 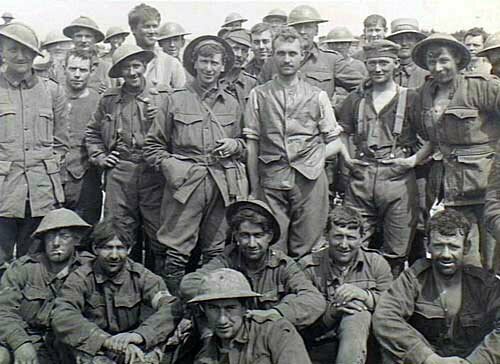 AAA wrote: The Australian officer corps did not spring out of nowhere, and it was clearly very un- British. Yet Australia only became independent of Britain in 1901, and Duntroon was only established in 1911. Presumably the most important formative influence on the officer corps would have been the Boer war (where there were visible repeated follies by the professional British army fighting against the Boers). Excellent book on the raising of the Australian Army before World War one is Mordike, John, An Army for a Nation. A history of Australian military developments 1880-1914, Allen & Unwin/Department of Defence, North Sydney, 1992. He uses the "two camp" theory of the "imperialists" versus the "nationalists" for the direction that the Government and Army took in its formation (that has been disputed more recently) but gives a valuable insight into higher policy and personalities. The Australian Army was effectively militia until 1948. Peak Regular Army to that time was 1939 at about 2,500 all ranks - manning the fixed defences and providing training cadres for the militia units. Officers, until Duntroon came along, were selected by the commanding officers of the various battalions and regiments from suitable applicants (both internal and direct from the streets). They were subject to ratification by higher formation commanders. Some had been "rankers" and some had had service in the British Army and/or other forces. Some had seen service as a volunteer in the Second Boer War or in a couple of cases in the Boxer rebellion. They were trained in units and schools of instruction in their brigade or regiment. Remember the first class to graduate from Duntroon was graduated early to join the AIF as it formed and were earmarked for staff jobs (as were all subsequent classes in the much shortened courses during war time). In 1912 the first of the universal service intakes took place - all males were liable to service in the school cadets from the age of 12 until 18 (junior cadets 12 to 14, senior cadets 15 to 18) and then service in the militia until 29 (?) (though with decreasing liabilities to training). These personnel were not liable for service outside Australia. The AIF (Australian Imperial Force) of volunteers were liable for service anywhere on the globe. With insufficient time before the commencement of the war this meant that trained reserves were not large but it meant that many had had some exposure to military service before enlistment. Back to the officers - after the initial rush (when many moved from militia or were recruited as friends) many came from the ranks – having done their time and shown their worth. Many rose to comparatively lofty heights by the end of the war – from newly commissioned subaltern to brigadier general in the case of Gordon Bennett in late 1916 (but you had to survive and not be crippled by wounds to do it). It must be remembered that the Australian Army like the British Army had a steep learning curve, suffered horrendous casualties in the process. Many of the mistakes attributed the “butchers” of the latter group were actually caused or aggravated by Australian officers inexperienced in their tasks. The formations at the end bore little or no resemblance to those that had started the conflict. It must also be remembered that of the 5 officers on establishment of an infantry company at war’s end there may have been at best 2 alive and in action. The other platoons would have been commanded by serjeants and even corporals – ranks that have always been endowed by the Australian Army with a degree of independence of thought and action beyond that of their parent army. On the lower slope, however, the advance did not progress. The company of the 2/10th London nest to the Somme could be seen still sheltering half a mile from Chipilly. At 5.50 p.m. Brig.-Genl. Mackay of the 1st Brigade ordered Maj. Mackenzie of the 1st Battalion to send across the river a patrol under a couple of N.C.O’s who had been through Chipilly village early that morning searching for souvenirs, and had urged that they should be allowed to take a patrol. As the British were to attack, the request had been refused; but now the two - Coy QMS. Hayes and his friend Sergt. Andrew were told to take four men, find out what was stopping the attack, and, if possible, help it forward. Crossing at 6 p.m., Hayes went first to the company of the 2/10th London. Its commander, Capt. Berrell, advised them not to go on but the village was enticing, and, after extending to twelve paces interval, the six Australians made the rush, and, though heavily fired at from the ridge north of the village, got through unscathed. Berrell now brought up half his company which, as it reached them, was fired on by a machinegun in the valley to the north. losing some men. Meanwhile the Australians, after searching the village in two parties, worked up the spur northward and here sighted a post of Germans all intent upon their front. Ptes. Stevens and Turpin were left to guard the village entrance. Pte. Kane, a runner, was sent to the 2/10th London to guide up a Lewis gun crew. Andrews and Pte. Fuller pushed round to the back of Chipilly spur. Hayes, after watching two German machineguns firing in the valley, led a platoon of the British to a chalk pit on the northern outskirts. The obvious course was to take the Germans in flank, but as the platoon arrived the British guns laid a heavy barrage of smoke on this ground. The shells fell close, and the platoon was ordered back. The smoke, however, gave the Australians their chance. Sergt. Andrews and Fuller, who had returned, took Hayes along their previous track more than half a mile around the reverse side of the spur, and there sighted, on the slope above the river, a small German post. While Andrews and Fuller covered it with their fire, Hayes worked round its flank. As he rose to rush it he found himself looking into another post of three men, one of whom fired singeing Hayes’s tunic, but missed, and was at once shot by him. The others bolted but, on Andrews and Turpin running up firing, they too were captured and rushed back to the chalk pit. Telling the Londons to follow close Hayes, with Andrews, Fuller, and Kane, returned under cover of the smoke to the post previously attacked. The Germans in the second post retired, but following them, Andrews and Kane in front, and Hayes and Fuller in flank, sighted a stronger post and bore in upon it, shooting from the hip. The Germans dived into their dugouts from which, in response to a bomb, an officer and 31 men came out. Handing the prisoners to the Londons, who were now coming up, Kane and Fuller went on and captured nine more prisoners and two machine-guns. Germans from Chipilly ridge were now retiring eastward across the Somme. Andrews set up a German machine-gun and fired at them. American troops next appeared over the backbone of Chipilly ridge and the Australians, standing up, signalled them to advance, but amid the crowd of prisoners they themselves were mistaken for enemy and fired on by Lewis guns. All took cover until the Londons came up and the Germans finally broke from the ridge above. With Andrews firing his machine-gun, Fuller and Kane took another thirty prisoners. By 10 pm., having led the British advance the whole way, the patrol returned to its company. (later) Lt. H. D. Andrews, D.C.M., 1st Bn. Farmer; of Wauchope, N.S.W. ; b.Rawdon Island, N.S.W., 9 March 1897. Note all were decorated by wars end…..
Last edited by edward_n_kelly on 13 Sep 2006 02:18, edited 1 time in total. PS A good description of the the "Diggers" as at 1918 is at Official Histories – First World War Volume VI – The Australian Imperial Force in France during the Allied Offensive, 1918 (1st edition, 1942) Chapter 1 - The "Diggers" 1918. It is a 1.5 MB PDF file. If I'm right its been lamented that the ill-disciplined digger disappeared by WW2.Any thoughts on this? Consult the records of the reinforcements landed in Singapore in FEB42 or ask the US survivours of the "Battle of Brisbane" ! Peter H wrote: If I'm right its been lamented that the ill-disciplined digger disappeared by WW2.Any thoughts on this? If's off topic but I don't think so. http://www-cgsc.army.mil/carl/resources ... miller.asp discusses in detail an outsiders view of Australian troops in one key action of the war. Because of their edge in arms, the Germans were stunned by their defeat at the hands of the Australians. The Germans had rarely failed before, never encountered such defensive tactics, nor faced such a determined opponent. The accuracy and efficiency of the British artillery and antitank gunners and the discipline of the Australian infantry-who held their ground and fire until the German infantry and gunners advanced into a killing zone-had defeated the German blitzkrieg tactics. A captured veteran of the early European campaigns stated: "I cannot understand you Australians. In Poland, France, and Belgium, once the tanks got through the soldiers took it for granted that they were beaten. But you are like demons. The tanks break through and your infantry still keep fighting." The Australians, who are the men our troops have had opposite them so far, are extraordinarily tough fighters. The German is more active in the attack but the enemy stakes his life in the defense and fights to the last with extreme cunning. Our men, usually easy going and unsuspecting, fall easily into his traps especially as a result of their experiences in the closing stages of the Western [European] Campaign. The Australians held out for almost eight months against the German siege at Tobruk. The siege was abandoned by the Germans after 242 days, when on 7 December 1941, Rommel made the decision to fall back to Gazala. However, on 21 June of the next year, Rommel began a second offensive that finally captured the fortress. At the time, the Australians' epic stand at Tobruk had a major impact on the war because the Germans suffered a serious and unexpected reversal. The Tobruk garrison demonstrated that the hitherto successful German blitzkrieg tactics could be defeated by resolute men who displayed courage and had the tactical and technical ability to coordinate and maximize the capabilities of their weapons and equipment in the defense. Australian troops had, at Milne Bay, inflicted on the Japanese their first undoubted defeat on land. Some of us may forget that, of all the allies, it was the Australians who first broke the invincibility of the Japanese army. Both the Germans and the Australians were exhausted by 14 April. The Australians, however, were close-knit, aggressive, devil-may-care types with a strong will to fight, yet with a con tempt for heroics. Ironically, until the probing attack against the 2-17th's positions on 11 April, the Germans had believed Australian morale was low. Consequently, they were both surprised and shaken by the Australians' stiff defense, including the weight of their artillery and their use of the bayonet. Though still well disciplined and confident, this experience caused the Germans to lose some of their arrogance. Many of the German units had fought as part of the 3d Panzer Division during the campaigns in western Europe and had been driving the British forces in front of them for three weeks. Up to the time of the battle, the Australians had been untried, but now they had fought an exhausting, yet successful, delaying action at Tobruk. "My God, I wish we had [the] 9th Australian Division with us this morning." Major-General Freddie de Guingand, Chief of Staff, Allied Land-force Headquarters Europe, D-Day, 1944. That would be a wonderful "what if" but few would join in. Jane Ross' The Myth of the Digger did some comparasions between the 1st and 2nd AIF. In her view the Diggers of 1939-45 served in a less egalitarianistic environment than those of 1914-18.Promotion from the ranks was harder,officers were less seen as "mates",drill and parade BS was more focused.Morever extended leave in places like Britain & France was not available to play up and be the larrikin.The virtues of the citizen soldier of 1914 were still there in 1939 but somewhat dulled by the experience of the Depression,a greater gap between the privileged and poor had resulted. Peter H wrote: Jane Ross' The Myth of the Digger did some comparasions between the 1st and 2nd AIF. I reseach the Camel Corps and ALH and found that the myth about us (Aussies) prom officers from the ranks (meaning they took anyone) to be false. Of cause there may be the odd one or two to be done as such, but well over 90% of these men prom to officers were men who had had previous service (milita or Boer War), were educated (teachers or uni students) or men with a wide range of experience in the civil life (like graziers, clerks, managers accountants and such). The idea that anyone could become an officer is not always correct as many soldiers with the above skills didn't become officers while say the odd tram driver did. But what was the Tram drivers back ground to become that officer is harder to find out from the service records now availible to us. Now what I mean is sure men were prom on merit but that merit had to be backed up with some form of background to give the man a chance to lead soldiers in battle. And yes we didn't look at there social background to do that but if they did have that back ground then yes that helped there move up the ladder. We see that in the lists from the best schools in aussie where there ex students are shown, most are seen as officers or NCO's and many of those as Pte soldiers were such for a short time before moving up the ladder if not KIA or WIA before so. I think Gammage did a check on AIF officer backgrounds and most were former 'Public' school boys.Someone uneducated or of the lower classes like Albert Jacka was the exception to the rule.Who you knew also played its part. Gary Sheffield in his studies on the BEF also noted the 100,000 or so officers that had been promoted fro the ranks by the British Army.Class,background a determinate there as well.Sheffield presents the case that the myth that the British did not promote from the ranks is untrue. Haig interesting enough said he considered the New Zealanders the best Dominion troops.They fought like the Australians but drilled like the British Guards.However NZ did also carry the death penalty in their books for those on military service.Approx 10% of the New Zealanders were of Australian background anyway according to one study.